Sister to Sister - Standing Together through the Storm! One year after Superstorm Sandy, Girl Scouts stand together to remember the impact we can have on a community and the importance of being a sister to every Girl Scout! I just got home from the best Girl Scouting event EVER!!! It was called DELL’S GIRL SCOUTS GAME ON. 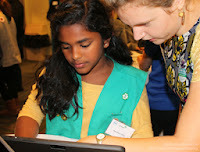 Girl Scouts from all over came to check out DELL’s new game for Girl Scouts, Be the Video Game Designer. Be the Video Game Designer allows girls (and boys if they’d like) to create a video game of their own with a few simple applications and clicks of a button. I was able to choose a character, title, setting, etc. and I put them together, to build the main pieces of a video game. I learned how to change the game script to make it harder or easier to play. Once I was done creating my game, I was able to play the game and share it with friends and relatives. The great part about this program was how it inspired me. Since this game was supposed to show girls how to make a video game, I saw a really great, new way on how to solve problems. There are so many issues with our world that need to be solved and can be resolved! A problem that I think is really important and that I think needs to be taken care of is bullying. I am pretty sure that almost everybody has been bullied at least once in their life and wasn’t very happy with it. I think with the right pieces, we can create a video game that shows what a horrible thing bullying is and put a stop to it. Also, I think there should be a way for us to create a video game that helps people learn how to read and write. I come from a family that is from one of the many third world countries and I’ve gone there to visit family. When I was there, I saw lots of people struggling to get by. Most of them had homes, but very few had an education. Though most were poor, almost every single person had at a cell phone. This is the great thing that could help us! Since most have cell phones, we can create an app for phones that is a lot of fun, but also educational! As the person plays, they are learning fundamentals like reading, writing and spelling. Girls can learn coding and make this all come alive! This could end problems that are just waiting to be ended! I can’t wait to see what will happen in the lives of girls in the coming years. This is Amritha signing off for now. LET’S GO GIRL SCOUTS! Girls who were impacted by the storm and those that helped out had a chance to meet each other on Sunday at GSNC’s Sister to Sister: Standing Together through the Storm. They had the opportunity to share stories, trade Girl Scout SWAPS, create a Sister-to-Sister collage, and learn how to help replenish eel grass in ocean areas. With help from Project Hope, girls created a tree filled with their hopes for the future. 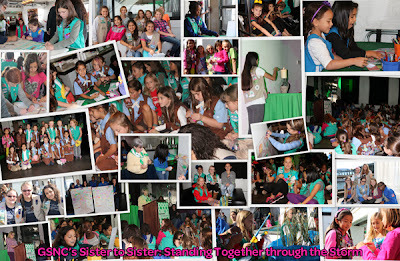 "It was amazing to hear the stories of so many girls impacted by Superstorm Sandy at the Sister to Sister event. Girls were smiling as they shared their stories with each other. You could see how happy they were to be together and how supportive they are of each other. We all went home knowing that those that were in need, as well as those so willing to help out, really understand what it means to be a Sister to every Girl Scout." said Pat P., GSNC MVP Program Specialist. Donna Ceravolo said, "It was my privilege to be part of this event on Sunday. The thing that rang true to me in the days immediately after the storm -- that our Girl Scouts are so caring and generous -- was brought home again at this event where the girls stood "sister to sister" to laugh, share stories and swaps. We are all fortunate to be part of the great sisterhood of Girl Scouts." As our troops, communities and Long Island remember Hurricane Sandy; we encourage you to honor the surge of support and connections made with Girl Scouts near and far. Should you be "friends" with everyone on your social media accounts? I grew up in a time, where in order to sign up for Facebook, you had to have an email address associated with a college or university… yes, this means I didn’t have a Facebook account until June of my senior year in high school, when the university I planned on attending assigned me an email address. I was so excited to finally be able to join Facebook. I got wrapped up in the initial “friending” everyone I had gone to high school with and all those future friends I would have at college. After a few months, I realized I was “friends” with a lot of strangers; a lot of people I had never spoken with on a regular basis. I also realized that by having them as friends, I was sharing information with them. So, I went through my “friends” list and “un-friended” anyone I didn’t have regular contact with or anyone I had not known for what felt like forever. REMEMBER, when you post something, all those friends, see what you post and know that much more about you! NOTE: This week Facebook announced that they are relaxing some of its previous security provisions for minors who use Facebook. GSNC encourages all Facebook users to check their settings, understand what info is being shared with whom and make adjustments as needed. Parents should provide guidance and monitoring to ensure that their children--including high schoolers -- are safe. What is your Mags&Munchies Goal? I Cant Wait To.. be a Girl Scout!